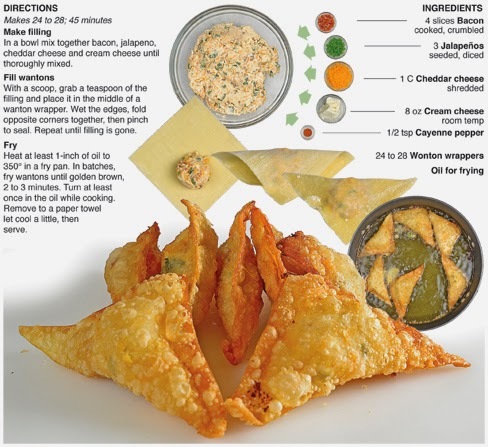 This is my favorite Super Bowl creation for 2014 - jalapeño wonton poppers. 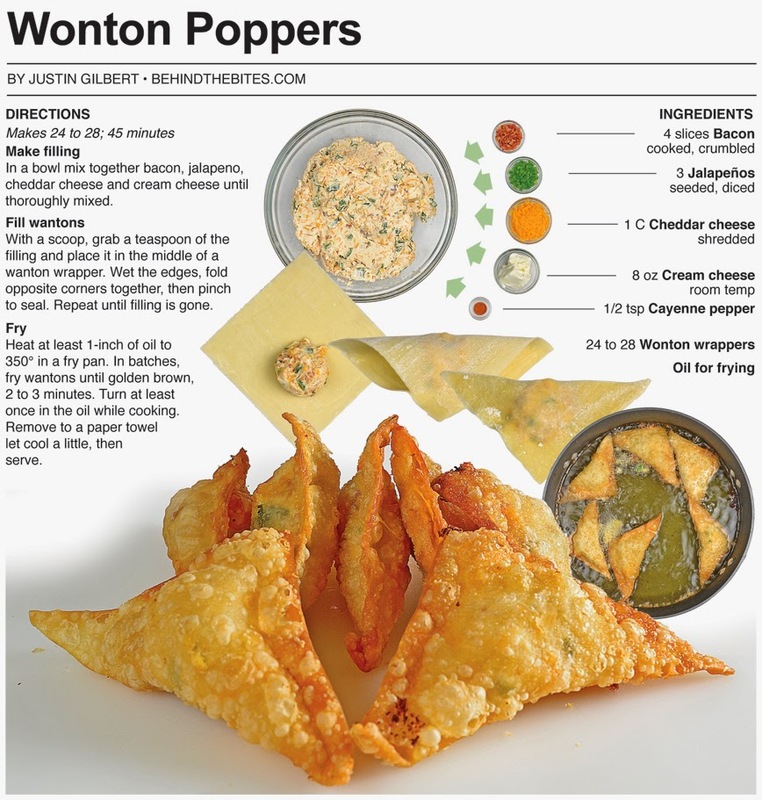 Which combines ... you guessed it ... Jalapeno poppers and wontons! Wonton wrappers are paper-thin sheets made from flour, water, eggs and salt and are sold pre-packaged at most super markets. 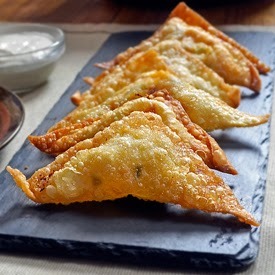 They can be filled with any number of ingredients or fillings and are usually steamed, boiled or fried. They are the Chinese cuisine equivalent to the Italian ravioli. 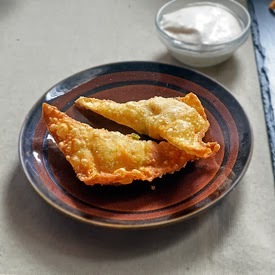 The wonton is the perfect devise to deliver the popper filling for this recipe comprised of cream cheese, cheddar cheese, bacon, cayenne pepper and jalapeño. Tradition poppers use either half or a whole jalapeño stuffed with filling and if you’re a popper fan like me, this means you may end up eating lots of jalapeños by the end of the night because they are simply to powerful to resist. Adding the jalapeño to the filling and using the wonton to deliver it requires much less of the spicy pepper and will help reduce indigestion caused by a spice overload. I have passed by wonton wrappers a number of times in the last couple months, picked up a package and pondered what I should make with them, only to put them back and move on. This time I went to the store knowing what I wanted to do. I have learned to be careful when impulse buying unique items, like wonton wrappers, that are perishable. I often buy things with the intent of making it in a couple of days or sometime during the week and the items sit in the fridge or pantry. The couple of days turns into a week and next week turns to two weeks and eventually what I bought has spoiled, dried out or wilted. I have gotten better at using everything I buy, but I still occasionally throw out an item or two. These wonton wrappers are easy to put off until tomorrow and very susceptible to being forgotten about until it's to late. I know because it has happened to me twice in the last two of years. So, if you’re not gonna make this recipe in the next couple days WAIT to buy the wonton wrappers. Don't just buy them to have 'em, they're easy to forget about and let go to waste. In a bowl mix together bacon, jalapeno, cheddar cheese and cream cheese until thoroughly mixed. With a scoop, grab a teaspoon of the filling and place it in the middle of a wanton wrapper. Wet the edges, fold opposite corners together, then pinch to seal. Repeat until filling is gone. Heat at least 1-inch of oil to 350° in a fry pan. In batches, fry wantons until golden brown, 2 to 3 minutes. Turn at least once in the oil while cooking. Remove to a paper towel let cool a little, then serve. I sure wish you delivered. Excellent recipe and presentation.